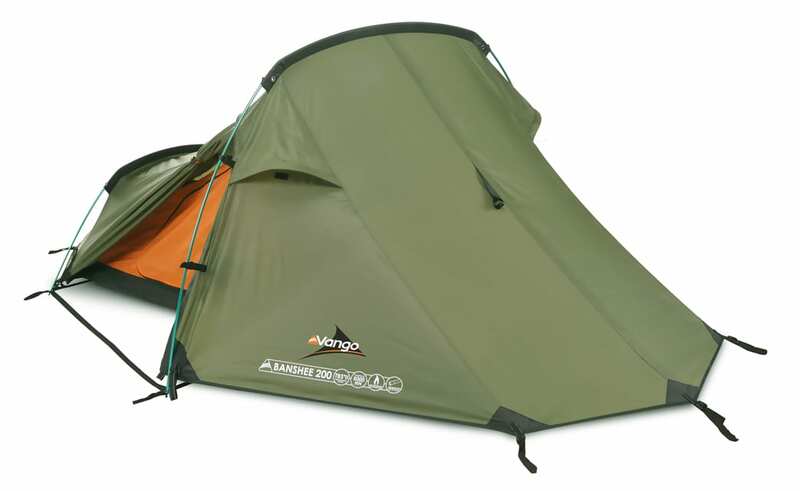 The Vango Banshee 200 is a pretty darned light tent that doesn’t cost too much either and that makes a great light (if slightly crowded) backpacking tent for 2 or, if you’re prepared to carry a bit more weight, a roomy tent for 1. It is compact and stable and should stand up reasonably well to wind and storms. This is not the roomiest of tents around and although designed for two people it is a bit of a squeeze. It is also a bit awkward as the entry is on the side, rather than on the top as with most traditional tunnel tents. The side entry helps give a small vestibule space for boots and bags, but it is also crowded. If there are two of you then you had better be pretty good friends as you’ll have to climb over the person closest to the door to get in. This is a really light tent in this class, tipping the scales at 2kg. If split between two people that is about as light as you can expect to go for a proper shelter. Vango has a great reputation so it is no surprise that this tent is well received. It is on the list of kit recommended for expeditions by the Duke of Edinburgh Award (for readers who don’t live in the UK, this is a series of expeditions aimed at young people to get them the skills and confidence to go hiking and camping). It also won the “Trail Best in Test” award in the August 2011 issue of Trail Magazine, a British outdoors magazine, in a review of budget two-person tents. In the test it was competing with the Robbins Trailstar 2, Berghause Peak 2.1, Gelert Apex2 and Coleman Cobra 2. Since most of these are pretty good lightweight tents, the Vango Banshee 200 did well to win. We’ve also been impressed by the Vango Ultralight 200 which weighs an0 amazing 1.3kg but costs a fair bit more (and is now just about impossible to get hold of.